Prestige has met with resounding success over the past decade, filling a unique niche in the very exclusive motor yacht market. 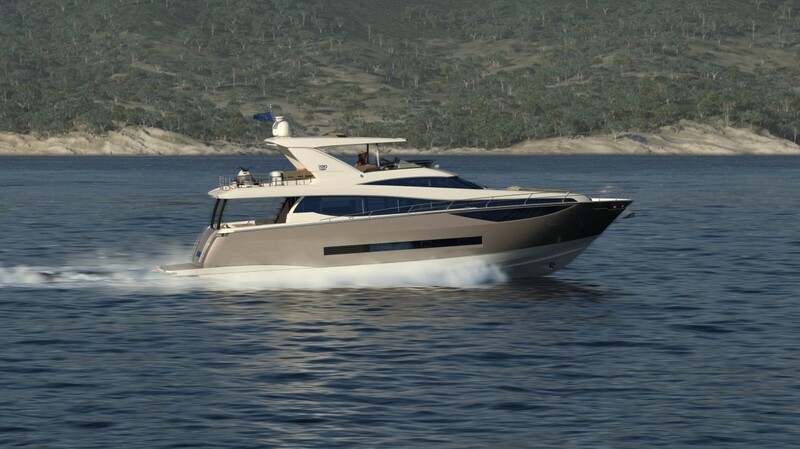 Following the worldwide success of the latest generation, PRESTIGE announces the arrival of their newest model, the PRESTIGE 720. This new model has been conceptualized for fuller enjoyment of life at sea, with exceptional exterior living spaces, from the extra-large swim platform to the spacious cockpit and generously sized flybridge. The layout affords privacy as well as safety and ease of movement on board. The arrival of this new 72-foot motor yacht marks a new chapter in the Prestige story. That being said, the 720 contains much of the DNA of the rest of the Prestige line; passionate innovation, enduring commitment to quality, layout originality and timeless design. The overall length is 21.99 metres with a waterline length of 18.4 metres and she comes with a maximum beam of 5.6 metres. The draft is 1.55 metres and the height above the waterline is 5.8 metres.